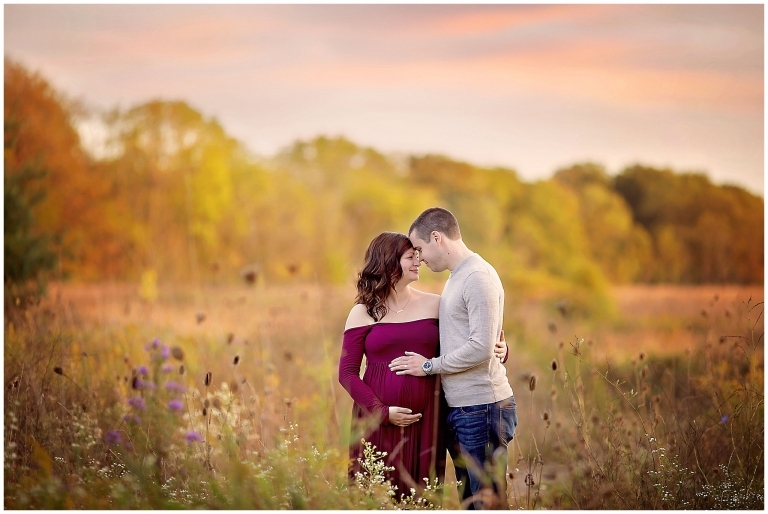 This yucky March weather has me dreaming of fall, so let’s hit rewind today back to the gorgeous colors and welcome Megan to the Akron maternity photographer blog! I loved meeting this sweet couple last October! They were so much fun to photograph and are so easy going! And of course they are absolutely adorable! No wonder their little girl was so a peach for her newborn session a few months later! Her newborn photography session is one of my all time favorites! I love this park near Akron Ohio for outdoor sessions! It has a great path in the woods, an open field, and a barn that makes it the perfect location for a photography session. There is a good variety of backgrounds and of course that yummy light at the golden hour! How gorgeous is this maternity gown from Sew Trendy Accessories on Megan? The color perfectly compliments the fields autumn colors! I have a feeling their baby girl will love seeing these photos in a few years. It is so special for kiddos to see how they looked in their momma’s belly before they arrived! I also love how maternity sessions capture that feeling of love and excitement soon to be parents have for their baby. This photo gives me all the feels! These two were so light hearted- we had a great time laughing! I know that being photographed can be uncomfortable at times, that is totally normal! So the best way for us to break on down is to joke and have a good time. Thank you so much for stopping by the blog! Love what you see? Are you looking for an Akron maternity photographer to document your pregnancy? Please contact me today to chat about creating your session!